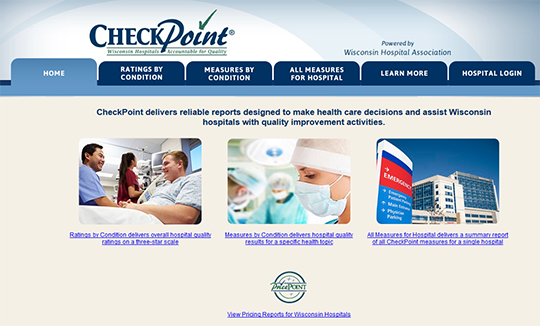 CheckPoint is a voluntary public reporting program of hospital quality, safety and service measures developed and maintained by the Wisconsin Hospital Association. The hospitals reporting to CheckPoint provide care to more than 99 percent of the state’s patient population. The site includes measures of how well hospitals performed when caring for patients with heart attacks, heart failure, and pneumonia as well as information on what hospitals are doing to prevent errors.